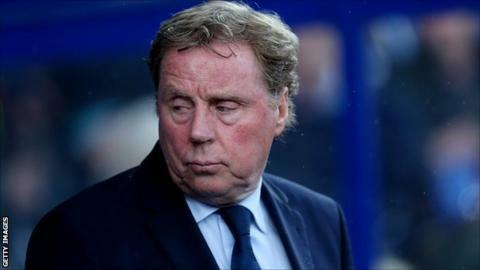 QPR manager Harry Redknapp says he is relishing taking his side to Wembley as they look to return to the Premier League at the first attempt. Charlie Austin's double against Wigan in a 2-1 victory at Loftus Road sealed a place in the Championship final against Derby County on 24 May. Promotion will be worth around £120m to the winners. "It will be great to do it for the owner and the fans and the players," Redknapp told BBC Sport. "That's all that matters. I'd love to get promotion for them. It's a great night for the fans and they've got a Wembley trip to look forward to, which is great." Redknapp, who won the FA Cup with Portsmouth at the national stadium in 2008, added he was "looking forward to going back to Wembley" with a Rangers side who were relegated from the Premier League last May. "We've got a great game to look forward to now with Derby, they are a good side so it will be an interesting game," he said. "There is not much between us and Derby that will be another difficult match." Rangers had trailed to James Perch's opener on Monday until Austin's 73rd-minute equaliser, and the striker popped up in extra time to win it for Rangers with his fifth goal in five games. And Redknapp paid tribute to the striker, who arrived at the club in August following a £4m move from Burnley, but was absent from late January to early April with a shoulder injury. "He's scored in almost every game since he's come back, he's so important to us," said Redknapp. "When we lost him we had a problem. He scored in a lot of tight games. He was our only real goalscorer." Redknapp said that midfielder Niko Kranjcar suffered a hamstring injury midway through the game, but hopes to have him fit for the trip to Wembley. "He is a fantastic player and person," he said. "He knows the game and has got great ability. I hope he is fit for Wembley, he felt his hamstring but played on."